In the Einstenian 4D space-time, past, present and future forms the Eternal Present where everything of past, present and future exist at once together, where nothing is ever destroyed, where whatever existed in the past exists for ever and everything in the future already exist. Every thing here is frozen like a sculpture. There is no movement and no vibration here, because movement is nothing but change with respect to time, and time is just one dimension in this space-time. Adwaida counts, me, you, and all of us as One, and it is here in this 4D space-time that this proposition of Oneness is most clear as we exist here as One cosmic tree of life, with the world-lines of each of us and every object in this cosmos constitute the many branches and sub branches of this cosmic tree, that spans past, present and future! Looking ourselves from the eye of the other! If you travel back in time and meet yourself in your childhood what will be your feeling and your experience? Will you be able to identify with your childhood body? Will you consider it as your body or as another body which you once possessed and experienced? If it is not your body then who is in that body now, driving it and making it alive? Western science has so far explained this travel into past, especially the so called grandfather paradox using the multiverse concept but without considering the mind, intellect or Self. Its solution by taking psychology into consideration is found only by invoking Adwaita. As per Adwaita you and the other person that you identify as not you, both are One. So is you and any of your former selves in the past or later selves in the future. In normal situation you can easily identify you as you and the other as not you. When you travel back into past and meet your childhood or travel into future or meet your old age, you are able to see with a rude shock, yourself as the 'other'. Yet this time you swear that the 'other' is actually you! So the 'others' you see in your present moment too must be you! To put it in another way, what we see as our current body (which we strongly identify as ourselves) is just a 3D cross section of your real body which is a serpent like elongated 4D body that extends into past and future and hence time-less and immortal! When we travel in time and meet up ourselves in past or future, we are seeing a 3D cross section of our body through the eyes of another 3D cross section of our body! Same Self resides in this snake like immortal 4D body of ours that is beyond the flow of time, but it turns both into the observer and the observed! It is like looking into the mirror! 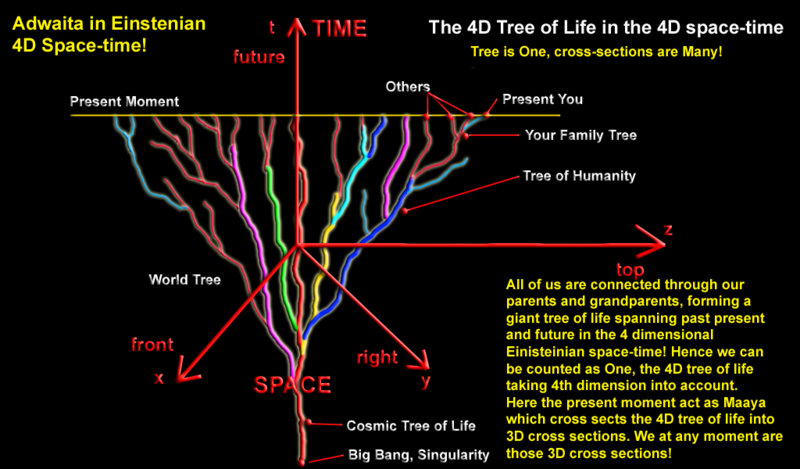 Our serpentine 4D body is connected with similar serpentine bodies of our family tree, with the similar bodies of all humans, all animals, all beings in this universe and with all objects in this universes. Same Self resides in this whole web of life lines of snake like 4D bodies! What we call our Self is same as this Self that reside in this whole cosmic tree of life! Thus we reach the basic premise of Adwaita that Self is One, plurality is an illusion! An austronaut above Earth sees Earth as a sphere. A farmer on the ground sees Earth as flat. It is practical to think that Earth is flat at the ground level, as a sphere is locally flat, and flat geometry is suitable in any local region on a spherical surface. Spherical geometry of Earth becomes of value only when you go high above or travel far. Same is true with Adwaita. Adwaita is equivalent to looking at reality from a greater height and it is equivalent to travelling far in the realm of spirituality. Contradictions arise when somebody try to apply its principles wrongly in the ordinary matters, like trying to see the spherical shape of earth in one's own local house plot. Time travel is one situation when we 'go high' or 'travel far' when Adwaita becomes relevant, in comparison to the ordinary materialistic view which sees every object as different, failing to see the inner connections and thus suffer from plurality! It is like looking at Earth from outer space and correctly compreheding it's spherical geometry as against staying at the ground, being deluded by its local flatness, which though useful and practical at that level, is but illusory. In a nutshell, time travel validates Adwaita. If Adi Sankara were around today, he would sure have used it to explain Adwaita philosophy. Time travel is the corollary of the space-time concept of Relativity theory which revealed time to be another dimension exchangeable with the three spacial dimensions, making past and future into two new directions like the east, west, north and south. Relativity and time travel concept, with quantum theory being another, are part of a series of revolutions in scientific thought that started since 1900s, as a part of the 'quickening' which is preparing humanity to make that big leap into a higher awareness. Time travel is a means by which Adwaita can be explained, like Sankara had explained it with other examples like the rope-and-snake, rotating-light etc. Significance of time travel is that it let a person see himself as a third-person. It gives you the same shock that someone will get when looking at the mirror for the first time! Incidentally the mirror-experience was,used to initiate Indra into Adwaita as per Chandogya Upanishad! Indra started comprehending Adwaita by seeing his own reflection in a river! All the sciences that emerged since 1900 has links with Adwaita. They are teaching us the same hidden secrets but in a Western grab. These are also not strictly Western. Time dilation is a frequent topic in the Puranas, where it says 1 day spent by Revati in the world of Brahma, resulted in the elapse of 1000 years! Quantum theory is all about observer-observed interconnectedness which is also the subject of Adwaita! If Quantum theory is bogus then we don't have electronics, no computers, no internet and no facebook! If relativity is bogus, then there is no photonics either! Adwaita is actually mathematics, the language of the gods. Its clarity diminishes when expressed in any human language, the most faithful language to express it being Samskrit. You cannot banish mathematics from physcics, because anything that is conceivable is expressible clearly in mathematics. Physics filters down all that is conceivable in mathematics into a subset, which we know as physical laws based on various physical theorists. All the conceivable forms of chemistry is already conceived by physics and all possible biology is conceived by chemistry! Yet we have biology as a specialization, because chemical laws are too subtle to explain all the variety of biological phenomena. We have chemistry as a topic because all variety of chemical phenomena cannot be covered by the subtle laws of physics giving rise to them. Similarly we have mathematics and since its principles are too abstract and subtle, we have physics which derive nourishment from mathematics. Adwaita sits at the level of mathematics. Dwaita and Adwaita:- Water lilies in a pond. Dwaita counts many flowers. 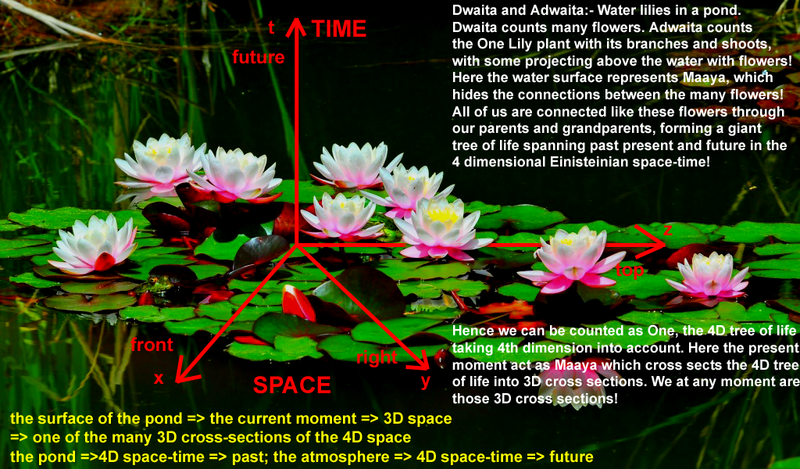 Adwaita counts the One Lily plant with its branches and shoots, with some projecting above the water with flowers! Here the water surface represents Maaya, which hides the connections between the many flowers! All of us are connected like these flowers through our parents and grandparents, forming a giant tree of life spanning past present and future in the 4 dimensional Einisteinian space-time!Hence we can be counted as One, the 4D tree of life taking 4th dimension into account. 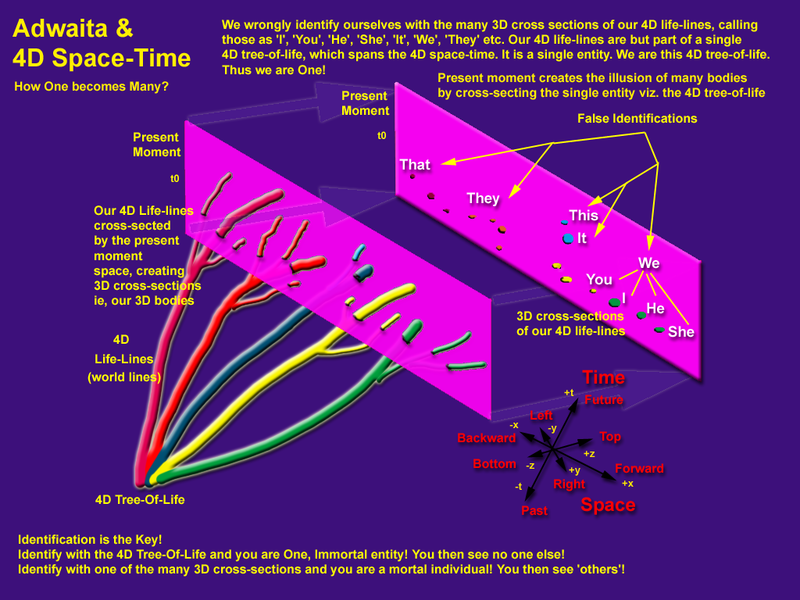 Here the present moment act as Maaya which cross sects the 4D tree of life into 3D cross sections. We at any moment are those 3D cross sections! Assume that a sheet of white paper is pierced by a U shaped magnet. A dualist will count Two objects (the two legs of the magnet) projecting out of the paper, unable to see the curved face of the magnet hidden behind the paper, which connects the two legs. Non Dualist will count One object, ie the U shaped magnet itself as a whole! Here the paper represents Maaya! Maaya is the one that make One appear as many! Looking at ourselves from the eye of the other! If we can look at our body from an eye that is not situated on our body, that may help us shake away from our body-centrism and lead us to Adwaita! The words, 'I', 'You', 'he', 'she', 'it', 'we', 'they' are all 'pointers' pointing to the same Self! When Adi Sankara lived in 8th century, there were no theory of relativity, quantum theory, motion pictures, computers or programming languages! If they were, then he would have used each of these to explain his Adwaita philosophy! This also points to the genius of Sankara and the sages before him who promulgated such concepts which we are able to comprehend only now in this modern era!